I had my first scoop of Carmen’s Best Ice Cream about a year ago and it was love at first taste! The creamy texture and rich flavours of Carmen’s “He’s not worth it” ice cream melted my blues away. You’ll know that this tub of ice cream is special as soon as you open it. The sight of rich chocolate ice cream drizzled with caramel entices you as the lid comes off. Then, chunks of nuts and brownie bits appear with every scoop you get. With your first spoonful, you’ll discover that this ice cream is like no other. 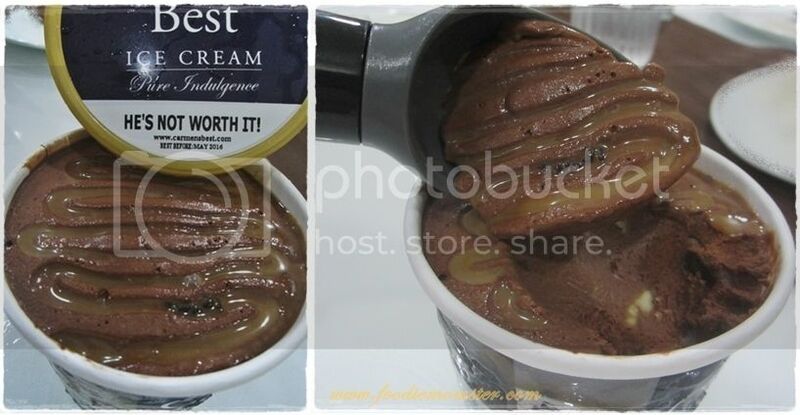 “He’s not worth it” is filled with rich chocolate and caramel flavours that is just perfect for an ice cream. I also loved the soft and chewy brownie bits and crunchy nuts in it. The mix of ingredients created a medley of taste and texture that made me love this tub. One can also tell that only fresh and quality ingredients were used in Carmen’s Ice Cream. It is no wonder that most people I know only had good things to say about this brand. 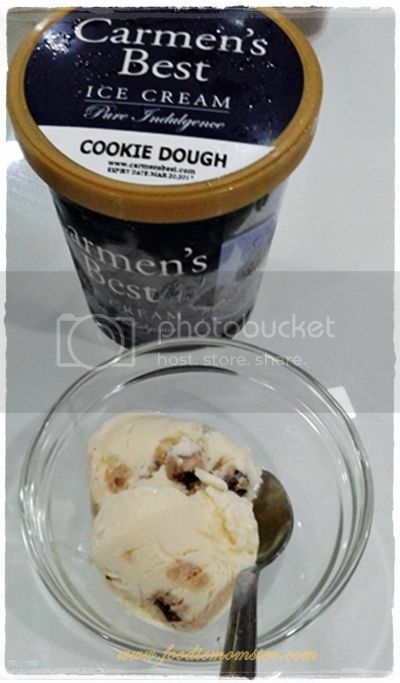 Aside from “He’s not worth it”, we also tried other flavours from Carmen’s Best Ice Cream. Jade and Jakei both love the Salted Caramel so we always buy it. Jakei’s love for chocolate placed the Malted Milk and Twix Swirl on his list of favorites. I also like the Malted Milk because it combines two of my childhood favorites, Horlicks and Maltsers. 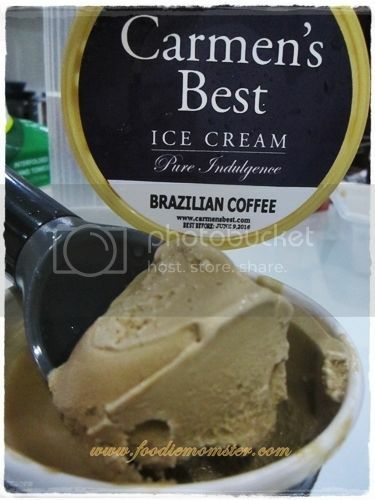 Coffee Lovers can take their pick from Coffee Almond Fudge, Brazilian Coffee, and Kahlua Coffee. One can appreciate the distinct flavour in each of these coffee ice cream variety. The Kahlua Coffee has a bit of a kick in it so I decided to take it moderately. Those who love nuts can try the Butterscotch Pecan and Pistachio flavours. The pistachio ice cream tastes great but I love the Butterscotch Pecan. It really does taste like butterscotch with a melt in your mouth goodness. The smooth buttery taste of the ice cream makes a great contrast to the crunchy and chunky pecan nuts. Another favourite is the Cookie Dough Ice Cream. Vanilla ice cream with chocolate chip cookies is one of my classic comfort foods. But it is not just me, the kids love it too. Their Milk Chocolate, Rocky Road, and Cookies and Cream is also worth a try. Sometimes we mix and match ice cream flavours or go a la mode. As for me, I love Carmen’s Best Ice Cream just the way it is. In my opinion, this ice cream brand stands out in the local market. They even bested imported brands that I usually crave for. In terms of pricing, it more expensive than local brands. But the taste and quality of this ice cream more than makes up for it. 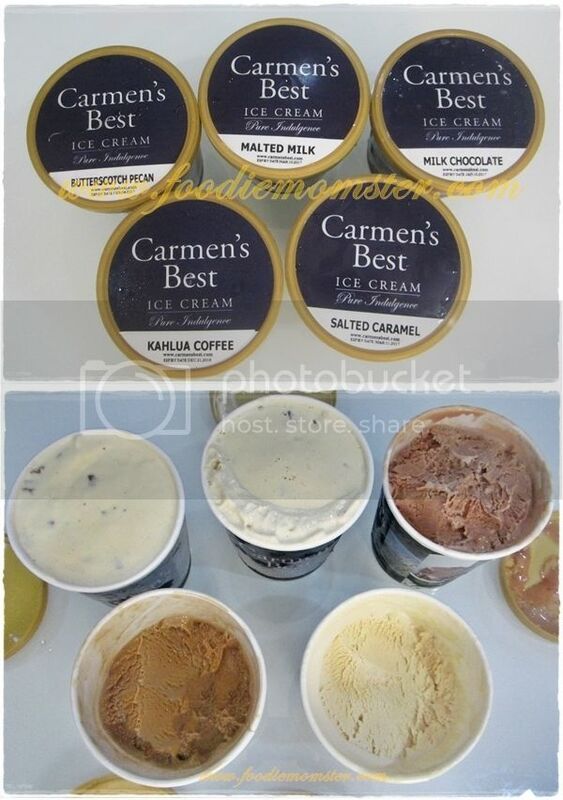 We buy our Carmen’s Best Ice Cream from Robinson’s Supermarket and Islands Pasalubong outlet in Katipunan Ave. You can also get your scoop of the best ice cream around from an outlet near you.